Allan Baker, left, and Terry Spridgeon hold a pro-life banner during the Jan. 20 Witness event on Monument Square. 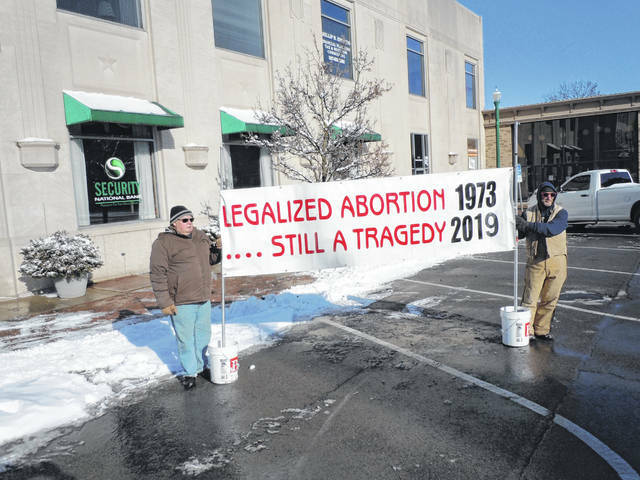 Champaign County Right to Life’s annual pro-life Witness against Roe v. Wade was held on Sunday, Jan. 20 from 2-3 p.m., in 14-degree temperatures in downtown Urbana. Attending were Pastor Brian Wonn, Fr. Matt Lee and members of Grace Baptist Church, First Baptist Church of Urbana and St. Mary’s Catholic Church. Twelve people braved the cold on Monument Square and others gathered at St. Mary’s to pray for an end to abortion. Those interested in helping Champaign County Right to Life with its ongoing campaign can call 937-653-6745 or e-mail ccrtl1@gmail.com. Information from Champaign County Right to Life.